Among his many projects, Kyongbum Lee, chair and associate professor of chemical and biological engineering at Tufts School of Engineering, studies these complex cellular reactions and the role they play in the body. His goal is to be able to coax cells’ metabolic processes so they produce what the body needs or detect disease in its earliest stages. These days, Lee and his colleagues are busy identifying the chemicals produced when the bacteria that live in mammals’ guts metabolize food. In addition to cataloging those chemicals, called metabolites, the researchers are testing each one to determine their impact on the body. 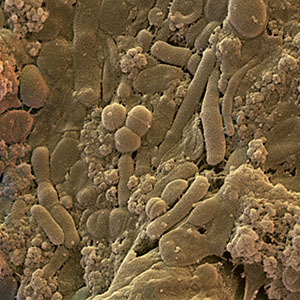 Can the products produced by bugs in your gut affect your health? Your weight? Your mental health? Our reporter spoke with Lee to see what his findings have shown so far. Tufts Medicine: What does your lab do? Do scientists know the functions of any of these chemicals? Right now, we are looking at chemicals that we think have an impact on systemic inflammation. We are screening about 50 metabolites. We are looking at those metabolites one at a time. Probably the next frontier—I don’t know how many generations of graduate students down the road—would be looking at the axis of communication between the gut and the brain. The obvious thing here is appetite, but more broadly, it’s going to be fascinating to understand the link to behavior. There have been reports linking autism spectrum disorder (ASD) with altered gut microbial metabolite profiles. A really intriguing mouse study found increased levels of two microbiota metabolites in a model of ASD. Remarkably, injecting one of those metabolites into a mouse-induced, anxiety-like behavior. The cool thing is that our screening found that the other metabolite may play a role in modulating the immune system. We know that neuro-transmitters such as serotonin and dopamine are present in the digestive tract. Both these chemicals affect brain function. There are reports that people with post-traumatic stress disorder have an altered gut microbial profile. So we know there is some relationship between the gut and the brain. I think you could design microbes that heal and take care of the body. We could go about doing that by identifying key chemicals that you need to have in your system to stay healthy, say, to ward off infection. Once we identify those molecules you want to have, it could come down to eating the right kind of food; for example, more broccoli. We know broccoli’s a healthy food, but we don’t really know why. Maybe it has all those chemicals you need. But we can also imagine engineering microbes to produce those needed chemicals. Or we could think about engineering microbes that would indicate the onset of disease or let us know how effective a given treatment is. That could be a game-changer for global health.